The above-mentioned report about the number of patent applications worldwide was published by the JPO on June 29. 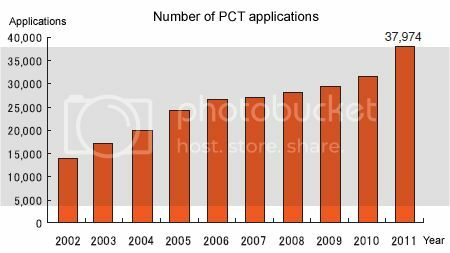 In 2011 the number of international applications (PCT applications) submitted to the JPO has increased abruptly to 37,974 applications, an increase of 20.5% compared to the previous year. However, the number of Japanese national applications apparently is leveling off. You can see the tendency of Japanese applicants to put emphasis on internationality. 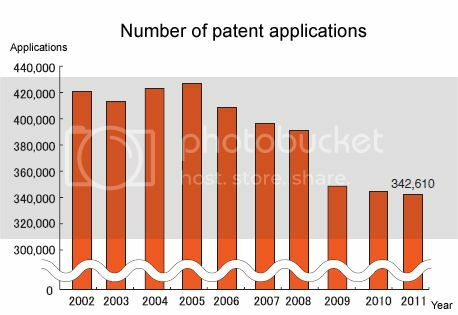 The total number of patent applications worldwide reached the highest amount so far of 1,980,000 in 2010 (an increase of 7.2% compared to the previous year). Also because of the recent increase of Chinese applications the chances that in 2011 this amount will be exceeded further are considered to be high. (Picture on the right) This shows that the rapid increase of Japanese applications (an increase of 20.9% compared to the previous year) and Chinese applications (an increase of 33.4% compared to the previous year) pushes the general increase of PCT applications. 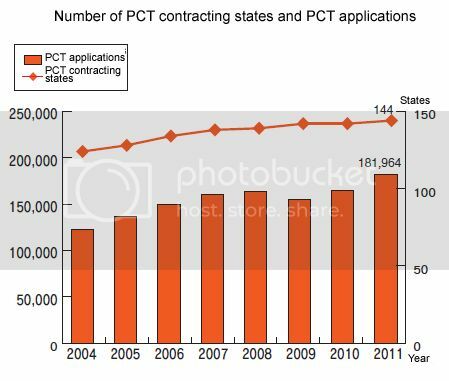 Furthermore, in 2011 the number of PCT contracting states was 144. 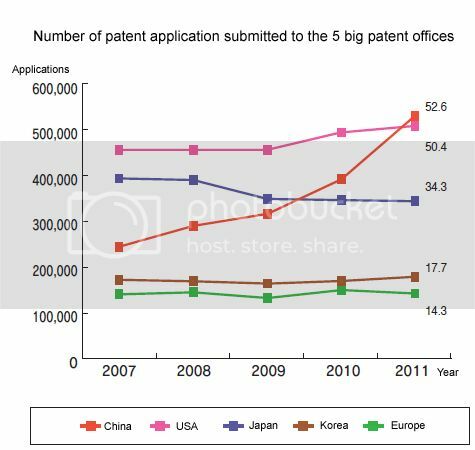 When looking at the number of applications submitted to the 5 Biggest Patent Offices (China, Japan, Europe, America and Korea) especially the increase of Chinese Applications (2011: 526,000 applications, increase of 34,6% compared to the previous year) is remarkably. Japan that had been top in the ranking until 2005, was exceeded by America in 2006 und dropped to 3rd place in 2010. In contrast to that China exceeded Japan in 2010, also surpassed America last year (2011) and made it to being the nation with the most patent applications worldwide. This tells us that China is also turning into a big nation in the field of patens.